I finally have a chance to sit down and breathe after a few whirlwind weeks. I was fortunate to be invited to an amazing shop in Orillia, Ontario called Thimbles&Things and owned by an awesome lady named Sue! Her shop is a gorgeous, buzzing place filled with lovely quilts, lots of fabric and notions, super staff and incredible customers. There’s always something happening at the shop and Sue kept me very busy for my visit. I knew the trip was going to be great on the drive down- the weather was perfect, the scenery along Highway 7 and 12 breathtaking and I got to stop in at a couple of shops on the way there. 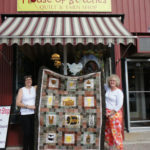 Both Appleseed Quiltworks in Lindsay and Quilters Cupboard in Uxbridge are lovely shops that truly reflect their owner’s personalities. If you get a chance to get out on the road this summer, be sure to visit. Appleseed is now carrying some of my patterns and we are trying to set up a trunk show/teaching day in October. Sue at Quilters Cupboard is also looking at potential dates for classes. After the leisurely drive enjoying the scenery I was alarmed at how dark the skies were getting as I pulled into Orillia- sure enough, the skies opened up and what felt like a monsoon moved through! Fortunately there was only A LOT of rain and some wind (a nearby town was hit by a tornado and thankfully no one was hurt!). I found my way to Thimbles &Things where I received a very warm welcome! Sue at Thimbles&Things has been a great supporter as I get this business going and she organized lots for me to do! I got to teach for two days, do a full trunk show for The Evening Threads Guild, do lots of mini trunk shows for interested groups of customers and attend a merchant mall in Barrie (all in three days!). She and her amazing husband Tony were also my gracious hosts and they kept me well fed and comfy during my stay. Tony even packed yummy lunches and dinners for when we were too busy to get home! It was a great visit, the classes were fun and I met so many friendly, fun quilters- I can’t wait to get back there in September for the Muskoka Shop Hop! I was asked to design the quilt for the hop and while it’s a secret till early September I can say that the title is “Postcards from Muskoka” and it’s a stained glass style quilt. I plan to stop in at the shops during the hop and do some demonstrations. The Evening Threads Guild had a mini-challenge to make stained glass quilts. Pretty impressive little quilts! It always amazes me how different the quilts look in different colours! I can’t wait to see these completed. The trip home was also eventful, more on that next time. I have updated the calendar and added lots of things with lots more to come. Thanks so much Sue, it was an awesome visit!